The dumbbell overhead press increases strength throughout the shoulders and engages the core for stability. It can be done in either a sitting or standing position, and with dumbbells held horizontally at the shoulders or rotated in a hammer grip. A sitting position helps stabilize the back, while a standing position works a wider range of muscles. 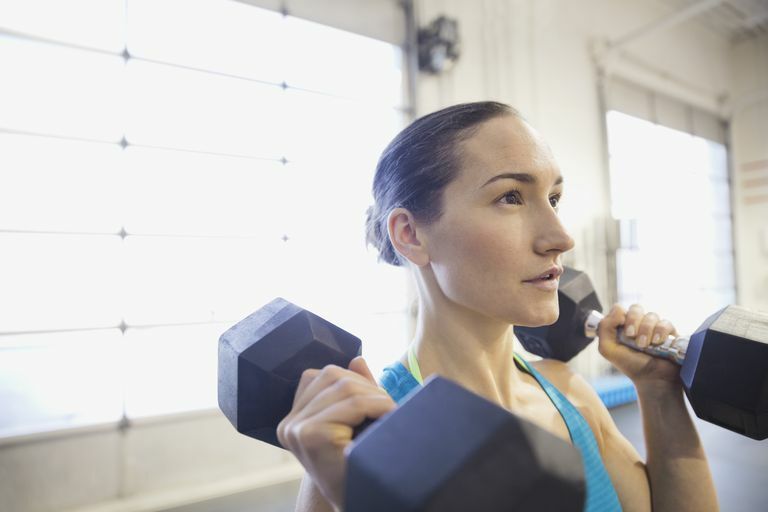 Beginners should pick a light weight to start, increasing it until you find a weight that you can lift with good form for 10 repetitions but feel fatique at the final rep. Women might start with 5-pound dumbbells and men with 10-pound dumbbells. You can use this exercise in any upper body strength workout. This exercise works all aspects of the deltoid muscle of the shoulder. While you can do an overhead press with an exercise machine or barbell, dumbbells offer some unique benefits. In using a dumbbell you have more activation of the anterior (front) deltoid than when using a barbell. You can also identify whether you have an imbalance in your shoulder strength. When performing it standing you will be challenging your core muscles to stabilize you during the press. In daily life, you may need to place objects on shelves above your head (or your luggage in the overhead compartment on a plane) and this exercise will build strength to do it safely. Stand upright and keep the back straight. Hold a dumbbell in each hand at the shoulders with an overhand grip. Thumbs should be on the inside and knuckles facing up. Raise the weights above the head in a controlled motion while exhaling. Pause at the top of the motion. Return the dumbbells to the shoulders while inhaling. Repeat for eight to 12 repetitions as desired. Option: Alternate arms, pressing up with one and then the other, instead of both arms at once. To get the most out of this exercise, avoid these errors. Don't point your elbows straight out from your sides as this will put stress on your rotator cuff muscles. Locking your elbows when you reach the top of your lift will transfer tension from your deltoids to your triceps, which aren't the target. For added stability, keep the shoulder blades down and back during the press. Don't push up explosively. Press slowly and smoothly. Control the motion of the weights, and don't allow them to stray too far forward or back during the push. Try to keep them slotted in a path above the head. For safety, keep your back straight at all times and don't arch your lower back excessively while raising the dumbbells overhead. Excessive arching in the lower back can be a sign that your weight is too heavy. Shift to a lighter weight to practice holding your back in a safe position and build up to the greater weight. During the exercise, lower the dumbbells only to your shoulders before pressing again. If you lower them more you increase the risk of straining your shoulders. Variations of the overhead press will have different effects on the muscles. While the standing overhead press is a classic move, you can perform an almost identical move while seated. A seated dumbbell overhead press is a better option for individuals who are getting started in strength training or for people with back issues or injuries. To do the exercise, simply sit on a bench (one with a back support is preferable) and follow the same steps. Changing how you do this exercise will challenge different aspects of your shoulder muscles. This exercise can be done sitting, standing, with alternating arms, or with a hammer grip in which the palms are turned in toward your face. Using a barbell is an additional option. Performing it while standing on a balance disc or BOSU is a further challenge to your balance and core stability. If you have a shoulder, neck, or back injury, talk to your doctor or physical therapist to find out whether this exercise is appropriate. It is possible to injure your shoulders when doing this exercise, especially if you are using heavy weights or poor technique. If you feel any pain during the exercise, slowly lower the weights and end the exercise. Only use a weight you can press with good form for 10 repetitions.